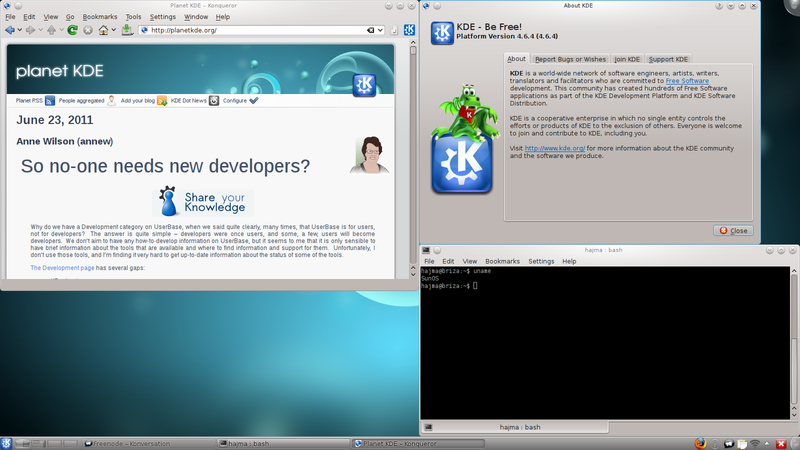 It took slightly longer than I expected (thank you pkg team), but finally, as of today KDE 4.6.4 is buildable from the kde4-solaris project repository. Upstream lists a number of bugfixes, but on the Solaris side I'm not as happy. Another inconvenience is a number of warning popups shown when connecting to secured websites in Konqueror. They also start a knotify process that gives out annoying bell and eats a lot of CPU. Last bad news is the loss of KDEaccessibility. Upstream has introduced hard dependency on speechd, so we can't compile until someone creates a spec for it.